“Polsinelli PC poached 10 lawyers from Husch Blackwell LLP this month, all in offices outside Kansas City. A group of four Husch attorneys in Washington who specialize in government contracts started at Polsinelli on Monday. They include shareholders Daniel Donohue and Steven Weber and senior partners Claude Goddard and Walter Wilson. It sounds like he made a good move. I’m sure it is a lot of work switching jobs. We all wish him good luck. 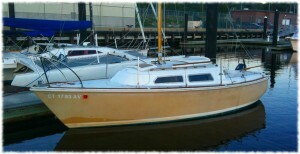 Our O’Day 22, “Carpe Diem,” enjoying her summer home. Today I finally put the boat in the water for the summer. I reserved a slip at the submarine base for two months starting today. The plan was to put the boat in the water right after work. However, there was a social at the officer’s club with free beer. So that took priority over putting the boat in the water. But only for a bit. I had parked the Jeep at the base marina and walked (and hitched a ride) to the social. I left the bar with Mark Matkovich (in his “much-better-at-towing-than-my-jeep” truck) and we headed home to pick up the boat and drove it down to the boat launch. It was much quicker this time than the previous launch. We had the boat in the water and the mast up in about 10 minutes after getting to the launch. It helps having two adults to do the launching and setup. 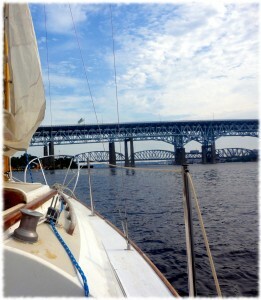 We took short trip up the river to the marina; spending a bit over an hour mostly motoring in the river. We did get the sail up for a little bit. Mark’s wife, Jessica, and baby, Michael, joined us for the trip. We even got to enjoy pizza with Susanna at her work after the sail. So here is the trip for today. The GPS track seems a bit screwy. We didn’t change altitude that much. Maybe the old iPhone can’t keep up with the navigation software. Susanna and the boys pulled out a couple of boxes of my old O-gauge train set when they were cleaning up the loft yesterday. Bill and I found the core of the train set when we were kids. Webster Groves used to have bulky waste pick up days once or twice a year (for all I know, they still do). 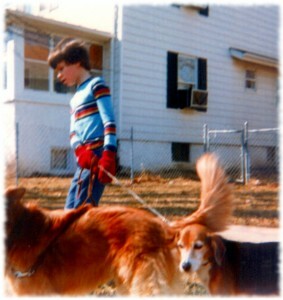 As kids, we used to walk around the neighborhood the night before the pick-up and see if there was anything good being thrown out. Kind of a pre-craigslist. 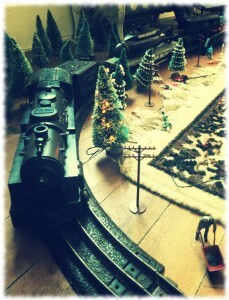 One year, Bill and I found a full, working, Lionel train set. I eventually bought out Bill’s half of the set. Over the years, I have periodically added to the set. 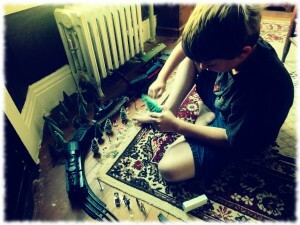 This morning, Will and Ben decided to empty the boxes out and set up the trains. The only working engine barely runs these days, and some of the old cars are broken. But it was a fun way to spend a Sunday morning. The boys are now outside playing with the boy from next door. Will’s diorama is still intact. Susanna is sitting next to me on the couch, interrupting me as I try to write. I’m a guy; I can’t multitask at all. I guess it is payback for all the times I interrupt her when she is trying to play the piano. The dogs are outside, though I’m sure it won’t be too long before Tropical Storm Tucker wanders through Will’s town and flattens the trees and topples the train. 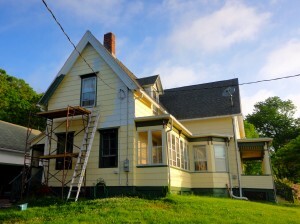 Though hopefully the buildings stay dry – that would be a mess that I would rather not clean up. The final life line installed on the O’day 22. Now ready for the summer. The forecast called for rain all day yesterday. But, if the weather people could predict the future, they would probably work in the stock market. And be rich. The rain had stopped by the morning. The stream in the back of the yard was pushing over its banks and running over the stone bridge in the back yard. By the afternoon the yard had dried enough to do some chores. 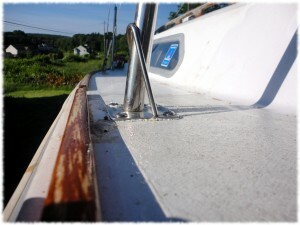 It takes two people to attach the deck hardware on the sailboat. One topside keeping the bolts from turning, and one below with a wrench. Normally it is a chore to find an assistant. Apparently tightening bolts isn’t the most exciting family activity. But yesterday I had a captive audience. 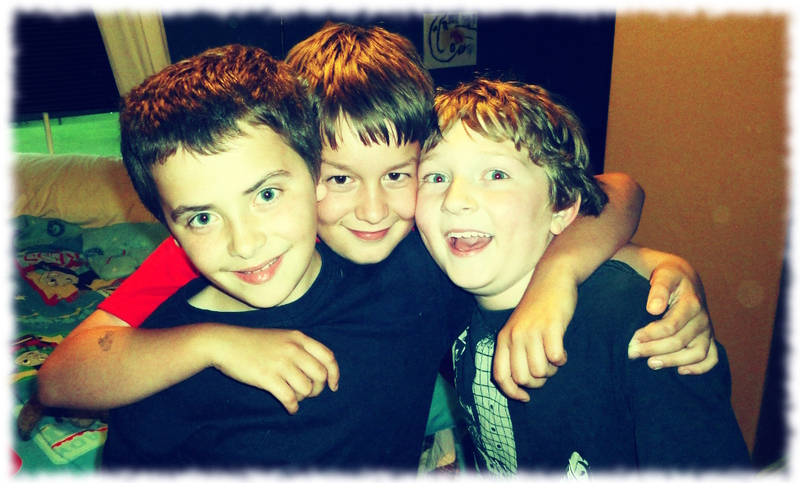 Will had gotten in trouble for hitting his brother yesterday – he was either stuck in his room or helping with chores. And apparently the most exciting chore available was to work on the boat. I’m not sure why he didn’t find cleaning the refrigerator exciting. It took us no time to install the two stanchions and the one missing eye bolt. Now the boat is ready for the summer. Or, as ready as I plan on getting her this spring. 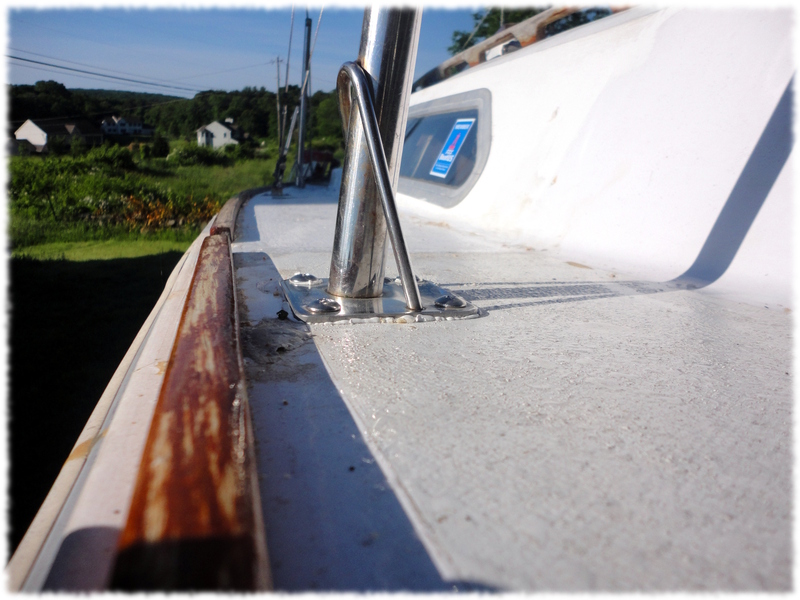 Of course, she needs the bottom painted, new bulkheads made, a better paint job… the projects are endless. Just not for this summer. The hope is to launch her next Friday or Saturday and leave her at the marina on the navy base until August. This morning found a bat on the roof of the Volvo. The morning’s first problem: What to do with the body. I could leave it for Susanna and take the Jeep into work. That would make tonight a little more strained at home than needed. I could leave it on the roof of the car. It would then either be left alongside the road somewhere or I would get to enjoy the look on the security guard when I drove through the gate. While potentially amusing, that didn’t seem the best plan. The humane thing seemed to be to toss the carcass in the field next door, and allow the bat to return to dust in peace. Or relative peace as food for the small scavengers that reside in the tall grass. So, off to the workshop for gloves. The only problem. She wasn’t actually a dead bat. Maybe almost-dead, but certainly breathing. The second problem for the morning: What to do with an almost-dead bat on the roof of the car. Again, some of the choices were clearly better than others (and I’m sure Susanna would agree that leaving her on the roof of the car was neither a smart nor nice choice). So I slowly backed the car out of the garage; hoping that she would fly off on her own. But the nearly dead don’t fly well. At least they don’t during daylight if they are bats. So I slowly nudged her off her perch with a broom. 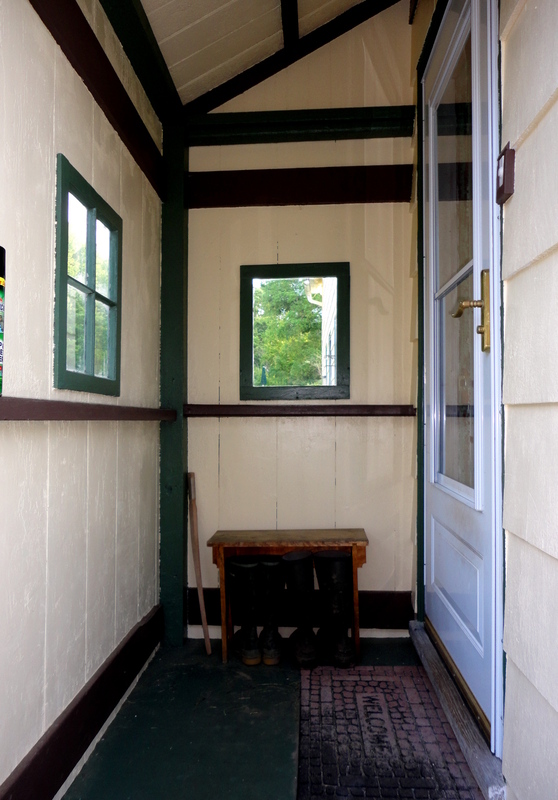 I pushed her over the precipice, and she glided down to the driveway. Gloves back on. I gently picked her up and tossed her over the wall, where she fluttered to safety under the big thorn-bush. Let’s hope that she was just disoriented from the sudden thunderstorm last night. Other bat carried concerns have frightening names like rabies. At least the dogs can’t get her on the other side of the wall.